The new cards aren't stopping as we have a bunch more reveals today, with a whole lot of Neutral showing up! 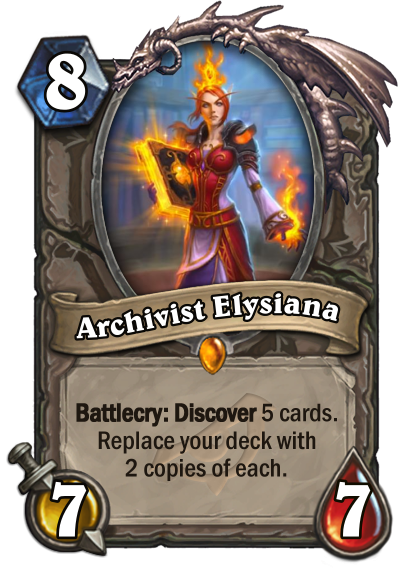 We start with Thijs' neutral legendary Archivist Elysiana! Thanks Blizzard for giving me a card reveal. So, what do you think of all this neutrality? All I'm certain of is my gut says...maybe. Elysiana will fit in any control deck aiming to go the distance. Play her the turn you're supposed to go into fatigue and you're set for ten more turns, which is huge. I find Lynchen hard to evaluate, because it is unclear what her effect is. Currently in your hand? Remaining in your deck? Both? Mountseller is just too slow. 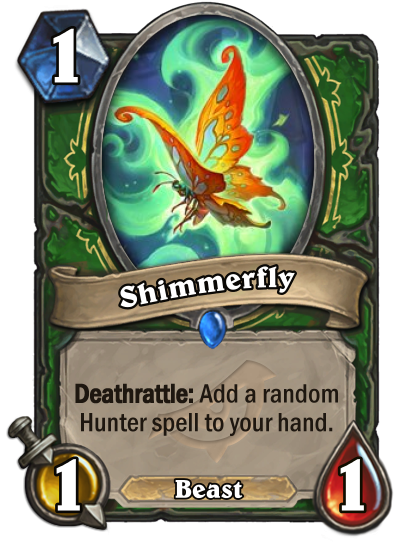 Shimmerfly is Babbling Book for Hunter and it's a beast too, so it will see play. The Hag... Not sold on it unless you can build a deck with crazy tribal synergy. 5/5 worth of stats for 4 mana isn't bad, but nothing spectacular either. Shimmerfly is probably the best of the bunch. Elysiana has potential, especially if fatigue decks or hakkar decks become a thing. Other two are pretty trashy. But it is a Deathrattle effect, which makes it worse then Babbling Book. Nevertheless, since it is beast I guess it will see play. Not sure about Elysiana - are there that many decks that indeed need more cards because of fatigue? Aren't you either dead much earlier (against aggro) or the opponent manages to pull of a OTK combo? Isn't it more efficient if YOU play the OTK combo? Sure, meta will change and I do not claim to have the biggest inside in meta in general. But personally, I do not see this card being played. 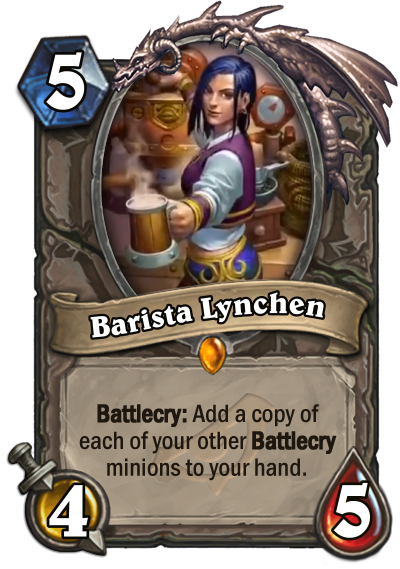 Barista is interesting, but like Keizoku said - we need to know exactly what minions the card refers to. Neither. As I read the text, the effect refers to minions which are on (your side of) the board at the time you play Barista Lynchen. I think it will be played, because there are many minions around with such a powerful Battlecry that even getting just one more copy of one of them is already worth it. Plus, it comes with a decent body for the cost, and it is neutral. But it is a Deathrattle effect, which makes it worse then Babbling Book. Nevertheless, since it is beast I guess it will see play. I was more seeing it as a replacement for Jeweled Macaw, which is rotating out of Standard. I don't think that being a Deathrattle is really a problem here, as 1/1 usually don't stick on the board for long, especially in a Beast Hunter deck. It will be played because it is a perfect first turn card. 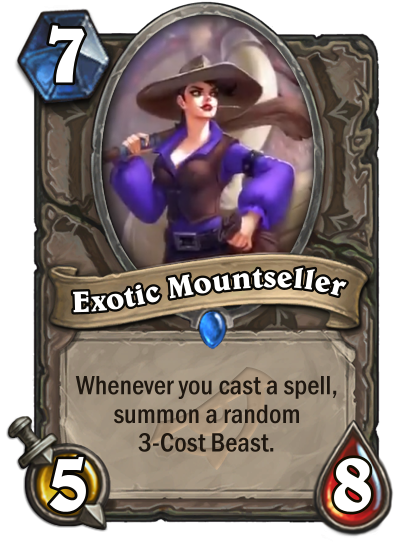 Mountseller could be interesting with the 0-mana-spells of Priest. I was more thinking of combining it with Echo spells such as Cheap Shot, Sound the Bells! or Pick Pocket. Or Unstable Evolution in Wild. But I must agree with Keizoku that it will be very slow to set up, likely too slow to actually happen. Wait...does "Elysiana" give you the five discovered cards in your hand and then replaces your deck with two copies of each or only the later one? If you get no cards in your hand she seems like an even more trashy version than the already highly situational Archbishop Benedictus. 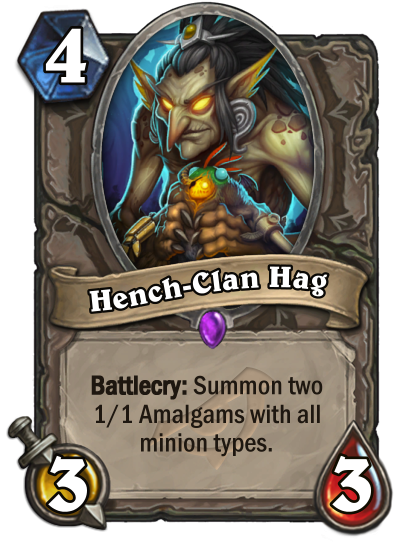 True, if you have him on turn 1 it doesn't matter if it is a Battlecry or Deathrattle. But if you draw him late, Battlecry is just better - because you can instantly play the card you get. Nevertheless, I agree that it will be played. I do not say it is a bad card, mind you. Just that IMO the Macaw or Babbling Book were better cards. Wait...does "Elysiana" give you the five discovered cards in your hand and then replaces your deck with two copies of each or only the later one? Hard to say for sure because the video cuts right after the cards are chosen, but no, I don't think you get the 5 cards in your hand. That would be way too powerful in my opinion anyway. Remains to see how this will interact with Tak Nozwhiske﻿﻿r. If the exact wording matters then it should not interact (Elysiana replaces your deck, it does not shuffle cards into it) but if it does interact then this is potentially huge. On the other hand, the combo would require 2 legendary cards and would still be pretty risky, so I doubt it would be worth building a deck around that, other than for fun if you happen to have the cards. My main worry is that choosing 5 cards among 15 will take some time, and you can't rush through it as these are the only cards you will get to play until the end of the game, so your survival depends on your decisions. This card may be less situational then Archbishop, because you'll have more power to decide what to put in your deck, while with Benedictus you must take what your opponent has. I can see at least 3 situation when this card is better then bishop: 1) when you draw him so lately that your opponent has less then 10 card in their deck 2) while your opponent is playing a midrangey deck that can survive to late game against control, but that will end his resources soon, or against a combo deck filled with useless combo card 3) in combo with Hakkar or similar negative cards in deck. Elysiana is built with the idea of either replacing bad cards in your deck (like infected blood) or delying fatigue for nearly 10 turns. You'll play this card in a deck that aims to win making your opponent lose by fatigue, like old control warrior. I owned a Prince Malchezaar Control Fatigue Warrior deck that had as win condition the golden monkey, and Malchezaar helped against other control decks because giving you +5 cards meant less fatigue damage, and if the legendaries were bad you could reroll them with the monkey. Elysiana could be good in a similar deck, now that some infinite resource generators are rotating away (or in wild in a meta without infinite generators), if a similar deck will exist.